As part of this morning’s Next Horizon event, AMD formally announced the first two accelerator cards based on the company’s previously revealed 7nm Vega GPU. 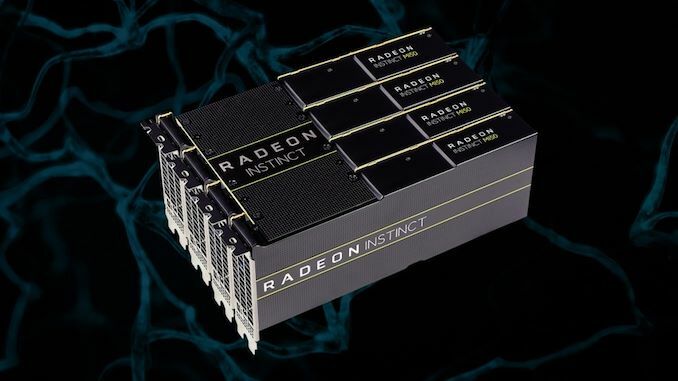 Dubbed the Radeon Instinct MI60 and Radeon Instinct MI50, the two cards are aimed squarely at the enterprise accelerator market, with AMD looking to significantly improve their performance competitiveness in everything from HPC to machine learning. Both cards are based on AMD’s 7nm GPU, which although we’ve known about at a high level for some time now, we’re only finally getting some more details on. GPU is based on a refined version of AMD’s existing Vega architecture, essentially adding compute-focused features to the chip that are necessary for the accelerator market. Interestingly, in terms of functional blocks here, 7nm Vega is actually rather close to the existing 14nm “Vega 10” GPU: both feature 64 CUs and HBM2. The difference comes down to these extra accelerator features, and the die size itself. 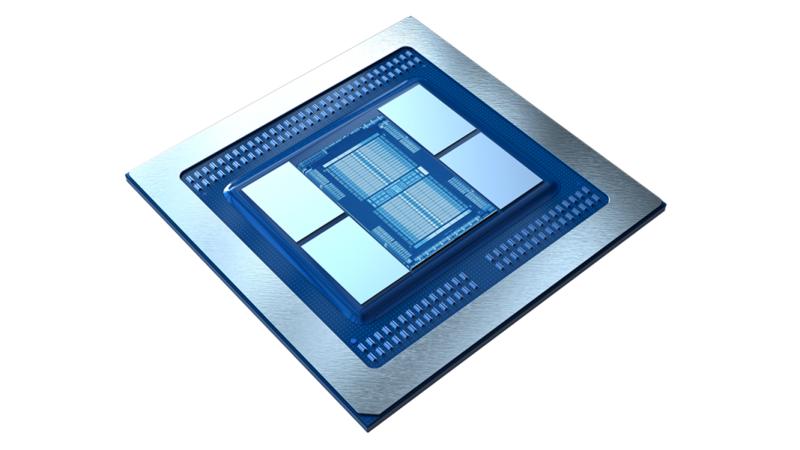 7nm Vega also buffs up AMD’s memory capabilities. The GPU adds another pair of HBM2 memory controllers, giving it 4 in total. Combined with a modest increase in memory clockspeeds to 2Gbps, and AMD now has a full 1TB/sec of memory bandwidth in the GPU’s fastest configuration. This is even more than NVIDIA’s flagship GV100 GPU, giving AMD the edge in bandwidth. Meanwhile as this is an enterprise-focused GPU, it offers end-to-end ECC, marking the first AMD GPU to offer complete ECC support in several years. The enterprise flourishes also apply to 7nm Vega’s I/O options. On the PCIe front, AMD has revealed that the GPU supports the recently finalized PCIe 4 standard, which doubles the amount of memory bandwidth per x16 slot to 31.5GB/sec. However AMD isn’t stopping there. 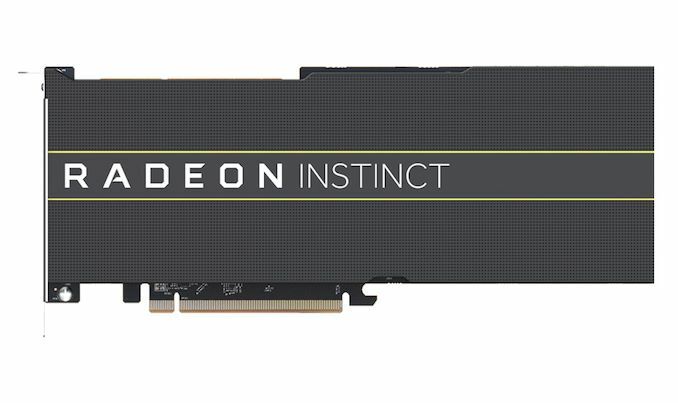 The new GPU also includes a pair of off-chip Infinity Fabric links, allowing for the Radeon Instinct cards to be directly connected to each other via the coherent links. I’m still waiting for a confirmed breakdown on the numbers, but it looks like each link supports 50GB/sec down and 50GB/sec up in bandwidth. Notably, since there are only 2 links per GPU, AMD’s topology options will be limited to variations on rings. So GPUs in 4-way configurations won’t all be able to directly address each other. Meanwhile AMD is still sticking with PCIe cards as their base form factor here – no custom mezzanine-style cards like NVIDIA – so the cards are connected via a bridge on the top. Meanwhile backhaul to the CPU (AMD suggests an Epyc, of course) is handled over PCIe 4. Finally, looking at the GPU itself, it’s interesting to note just how small it is. Because AMD didn’t significantly bulk up the GPU on CUs, thanks to the 7nm process the new GPU is actually a good bit smaller than the original 484mm2 Vega 10 GPU. The new GPU comes in at 331mm2, packing in 13.2B transistors. Though it should be noted that AMD’s performance estimates are realistically conservative here; while 7nm does bring power consumption down, AMD is still only touting >1.25x performance of MI25 at the same power consumption. The true power in the new cards lies in their new features, rather than standard FP16/FP32 calculations that the existing MI25 card was already geared for. Wrapping things up, Radeon Instinct MI60 will be shipping in Q4 of this year. AMD has not announced a price, but as a cutting-edge 7nm GPU, don’t expect it to be cheap. MI60 will then be followed by MI50 in Q1 of next year, giving AMD’s customers a second, cheaper option to access 7nm Vega. Neither Rome nor Instinct address consumer gaming PCs. These designs are HPC, cloud and within that segment perhaps DC hosted gaming for massive multiplayer setups where the multiplayer world data synchronization is a bigger issue than sending FHD resolution encoded GPU renders at acceptable latencies and bandwidth. For AI, ML, compute, data centres, etc.. It's very practical. In June, Anton made a rough estimate of die size from a photo at a demo. He estimated 336 mm2. The actual is 331 mm2.